I banged out two open hardware designs this week, designed for use with the OLPC XO laptops. The XOrduino is a stripped down low-cost Arduino-compatible board that plugs right into the XO’s USB ports. But wait, there’s more: it’s also compatible with the Scratch Sensor Board, so you can use this device to control Scratch (and Turtle Art?). It should be compatible with the Arduino IDE and all Arduino Leonardo-compatible shields. There are only 20 components needed for basic Arduino functionality, costing $5 from digikey (in quantities of 100 or more). Local labor or even older kids could assemble this by hand. The XO Stick is for when $5 per student is too much money. Based on the AVR Stick and the ATtiny85 processor, it costs only $1/student. It’s not as user-friendly as the Arduino-compatible board, but can be used to teach simple lessons in embedded electronics. XOrduino (schematic PDF, pcb PDF). I expect to have a small number of each board in a few weeks; let me know if you’d like one in exchange for help with hardware and software bring-up. 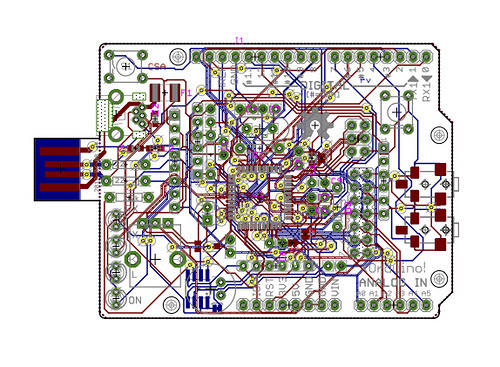 Schematic and layout review would also be appreciated (I did the PCB routing late at night under time pressure leaning heavily on autoroute, it’s certainly not the prettiest). And feedback from Arduino and Arduino shield hackers would also be welcome. For more details or to request boards, please see the original blog post, and Alessandro Paganelli’s review in Linux Support magazine.